Action History is an important part of any list or library that has actions being performed on it. Many of your lists or libraries will have many different actions and many different individuals collaborating. Infowise Ultimate Forms allows you to automate things such as reminders, but Action History can be helpful if someone drops the ball. Actions are one of the most powerful tools in the Infowise Suite and being able to keep an eye on them is invaluable. For instance, let’s assume you have a client’s list that acts similar to a CRM system and notifies individuals of where a client is in the sales process. The list has several different actions being performed on it as well as many different reminders but someone forgot to follow up with a new client and the client was lost. Action History would be an extremely valuable tool in this circumstance in that it would allow you to look directly at the item and see what the last action was performed and who the item is currently with in your workflow process. You can use the information to improve your process going forward. First thing we need to do is enable execution results to log. This is done inside of the Advanced Settings in our Infowise Actions screen. Click ‘Add execution results to log’ and save your Action. We need to enable logging for each action we would like to log. In Office 365, there are a few ways to access the Action History. A user can click on the ellipses next to an item to show the pop-up window listing all the actions performed on the item. Click the ellipses, then hover your mouse over Advanced and click Action History. 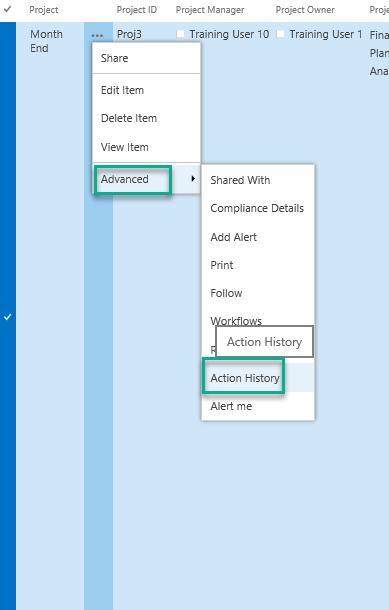 In Office 365 we can also access Action History through the ribbon as shown below. Setting up on-premise Action History is a bit different. 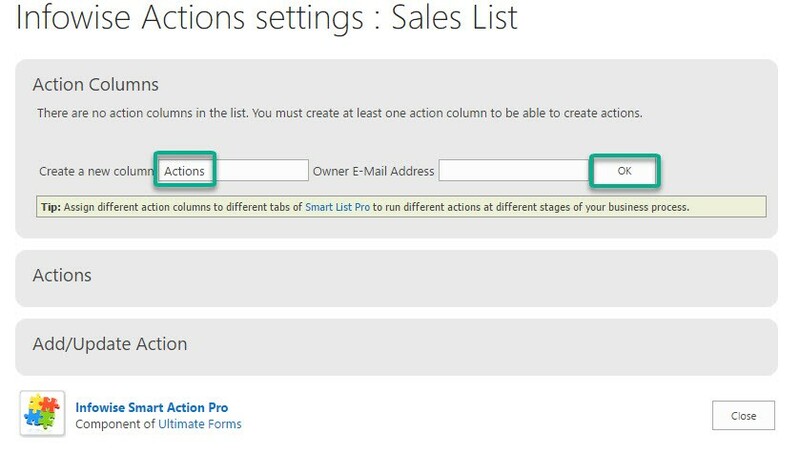 For on-premise, an Actions column must be created before when actions are added to the list. That column then allows you to expand for more detail view as shown below. When we click OK, Infowise automatically creates a column for you as shown below. Now that this column is created, Infowise will allow you to add an action to the list. 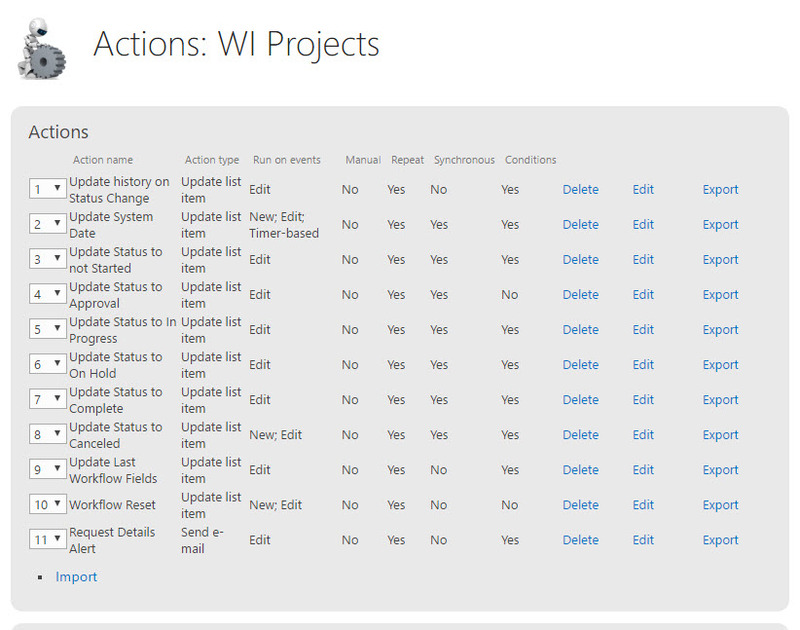 As you can see below, Infowise is connected to the newly created Actions column in the Advanced Settings section. Just like in Office 365, we need to click ‘Add execution results to log’ to enable Action History. You can now create your actions. In on-premises, Action History can be accessed through the ellipses as shown below. Often, we have many different Actions running on the same list. It can be difficult to tell where a single item is in our process or who needs to act on it next. Action History makes this easy by allowing us to log each action. It then separates the actions based on name. It logs the date and time as well as the success or failure of each iteration of an Action. Action History allows us the ability to audit our Actions and is an invaluable tool for tracking our Actions. 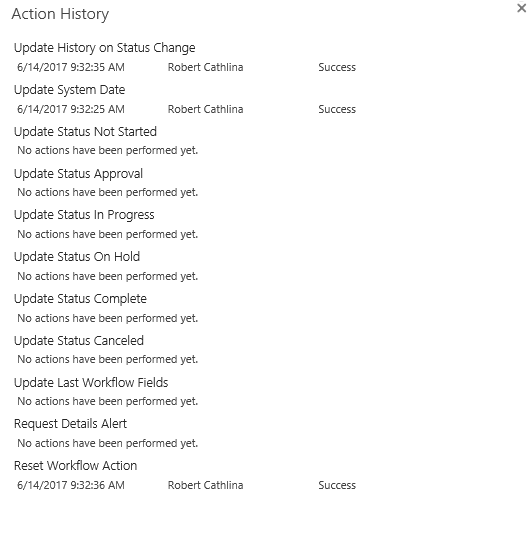 If an item in a workflow was somehow missed, we can use Action History to check who was the last person who touched the item and what action was performed. 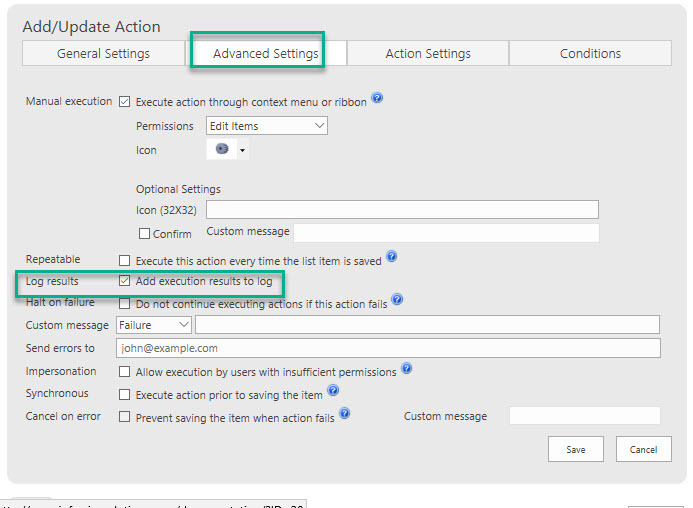 In this example, we covered how to enable logging of our action results and we showed the difference in accessing Action History for on-premise and Office 365. Actions are one of the most useful tools in the Infowise Ultimate Forms Suite. 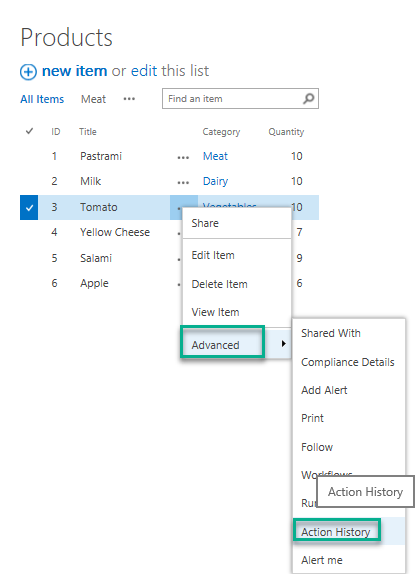 Actions allow you to build no code workflows on your lists or library and are powerful enough to allow you to build full scale applications in SharePoint. However, mission critical lists or libraries will often times have quite a few actions running on them. Action History is an invaluable part of the Infowise Suite and will help users to keep track and make sense of your workflow system.